In extended periods of summer drought, turf grasses turn brown and stop growing. This often looks a lot worse than it actually is, and the lawn will usually recover rapidly with renewed rainfall. It would take a severe drought to actually kill off the lawn. Drought-stricken lawns are prone to becoming worn and patchy. Credit:RHS/Neil Hepworth. All lawns require special care measures during dry weather. When deprived of water, lawn grasses may stop growing and start to brown, especially once the top 10cm (4in) of soil dries out. Ornamental lawns of fine bent-type grasses are most likely to suffer. General garden lawns containing fescue grasses may have more resistance. A well-maintained lawn usually recovers rapidly with the onset of autumn rainfall, especially if appropriate autumn lawn care is given. However, in extended periods of drought, or where the lawn is not well maintained, lawn grasses can become weakened and their roots deteriorate. If the grass becomes sparse, weeds and moss easily establish with the onset of autumn rains. Remedial action may be necessary. If summers become hotter and drier, as predicted, the issue of caring for lawns in drought will become more pressing, as water may be too scarce for lawns to be watered. Raise the height of cut in dry weather to avoid weakening the grasses and let the clippings fall back onto the lawn rather than collecting them. They will act as mulch and slow down the evaporation of water from the soil surface. Make sure the clippings are small, or they will smother the grass and cause damage. For established lawns that must be kept green, water once the soil becomes dry, but before the grass colour changes. 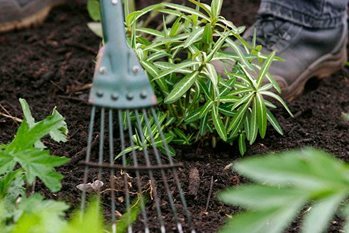 If the ground is very hard, aerate it by spiking with a garden fork before watering, to aid water penetration. Watering once every seven to 10 days is normally sufficient. It is important not to apply too much water. This is wasteful, encourages shallow rooting of the grass and promotes moss and turf diseases. Excessive watering makes the lawn less drought-tolerant in case of hosepipe bans or holidays when watering is discontinued. Ensure that the water reaches a depth of 10cm (4in) after each watering. Use a trowel to open a small test hole a few hours later to ensure the soil is sufficiently damp. By noting the duration of watering required to achieve this level of dampness, future irrigation can be more accurately applied. The average hosepipe sprinkler delivers up to 900 litres (200gal) of water per hour. If it is assumed that the sprinkler covers an area of 9 sq m (97 sq ft), in one hour it delivers about 100 litres per sq. m (22gal per sq. yd). Even in June or July, one square metre (yard) only needs 20 litres (4½gal) every seven days. On that basis, 12 minutes' steady sprinkling per 9 sq m (97 sq ft) should be enough. In practice, sprinklers vary considerably in their area of coverage, so the number of minutes required may not be exactly 12. By spacing jam jars over the lawn to catch the water, total water delivery can be estimated. Allowing the sprinkler to run until 2.5cm (1in) of water has been evenly collected in all the jars approximately equals the correct rate of water application. The autumn after a dry summer is the ideal time to carry out renovation and repair. This will help the lawn to recover from recent drought but will also make it more drought resistant the following year. Over-seed any sparsely-grassed areas using an appropriate mixture. See our advice on lawn care: spring and summer for more on doing this. Do not use lawn weed killers on drought-affected turf in autumn. Delay treatments until the following spring, when the grass and weeds are growing vigorously. Use a proprietary lawn moss killer, if required. While you can't prevent drought, you can take measures to prevent the damage drought causes your lawn. The most important thing to do is to ensure your lawn is healthy. A regular programme of spring, summer and autumn lawn maintenance will help lawns resist drought and recover strongly afterwards. If you are sowing or laying a new lawn, bear in mind that there are now drought-resistant grass mixes available which include micro-clovers. Mixtures based on these may prove more drought-tolerant and sustainable. Where the lawn is badly affected by drought, you may need to repair or relay your lawn in the autumn. There are other alternatives to consider. Ask yourself if you really need a closely-mown lawn. Why not let the grass grow longer and include meadow flowers and bulbs? Or replace the lawn with a gravel garden, drought-tolerant border, groundcover plants, decking or permeable paving.